Features the Middle Fork of the Flathead River (host and technical advisor, Glacier Raft Company) and Kootenai Falls, found between Troy and Libby on US 2. Northwest Montana is an extensive mountainous area on the west side of the Continental Divide in the far northwest corner of Montana bordering Canada to the north and Idaho to the west. The Region is home to two of the most popular travel destinations of the Pacific Northwest, Glacier National Park and Flathead Lake. The state department of tourism calls this "Glacier Country". Northwest Montana is a vast geographical area that encompasses the Bitterroot Valley, the Blackfeet Indian Reservation, the Clark Fork River area, the Flathead Valley, Glacier National Park, Kootenai Valley, the city of Missoula, and the Seeley Swan Valley. You will find outstanding travel and recreational opportunities throughout the region including horse packing, llama rides, trail rides, wagon trains, bicycling, hiking, backpacking, trout fishing, big game hunting, whitewater rafting, downhill skiing and cross-country skiing. Northwest Montana's many attractions include, in addition to it's wildlife and natural wonders, many community festivals, rodeos, Native American Pow-wows, antique shops, and museums. The area is known for active art communities where you may visit many artists' and potters' studios and galleries. 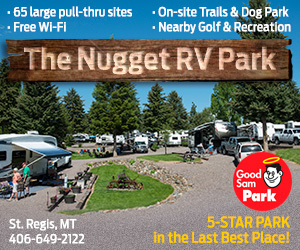 Visitors are presented with accommodations to fit most any taste and preference including bed and breakfast, cabins, vacation rentals, dude ranches, guest ranches, campgrounds, RV parks, motels, lodges, inns and resort complexes. This is a Glacier Country Regional Tourism Commission web site. Includes information on the region's activities, attractions, culture, wildlife and accommodation. Web site for a one-hour documentary co-produced by Idaho Public Television and Montana Public Television. Tribal members from throughout the Pacific Northwest describe the history of their people. The program is narrated by Nez Perce CBS news anchor Hattie Kauffman. "Sacred Journey" is a story about a physical trek over 1,600 difficult miles. It is also the story of a spiritual journey of healing, patience and pride that has led many Nez Perce back to their cultural roots. The city and highway map of Northwest Montana will help you locate cities, towns and major highways.